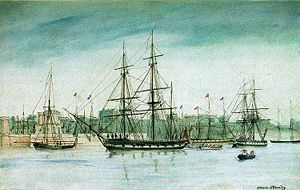 While on board HMS Beagle, Charles Darwin collected numerous specimens, many new to science, which supported his later theory of evolution. In biology, evidence of evolution or evidence for evolution is generally any of an available body of facts or information that supports the theory of evolution. Complications arise because several different meanings are associated with "Evolution." In a broad sense, "evolution" refers simply to any heritable change in a population of organisms over time. More specifically, "evolution" may refer to Charles Darwin's overall theory of evolution, which itself comprises two theories each addressing a different aspect of evolutionary change: The theory of descent with modification addresses the pattern of the change, while the theory of modification through natural selection addresses the process or mechanism of the change. The theory of descent with modification postulates that all organisms have descended from one or a few common ancestors through a continuous process of branching. The theory of natural selection offers one possible mechanism, natural selection, as the directing or creative force behind the perceived pattern of evolution. Some people, emphasizing the division of evolutionary change into two types—macroevolution above the species level and microevolution within species—assert that the evidences of natural selection as the causal agent of evolutionary change are found only on the microevolutionary level. Others, perceiving the distinction between macro- and microevolution as an artificial construct, assert that natural selection is a single continuous process encompassing not only major changes above the species level but also change within species. Those holding this latter perspective tend to consider all evidence of evolution as support for the comprehensive theory of evolution that includes both the pattern of descent with modification and the mechanism of modification through natural selection. Evidences from fossils, biogreography, homology, and genetics are among those used to support the theory of descent with modification. Evidences also are applied to support the theory of natural selection on the microevolutionary level. Evidence that would apply to natural selection at the macroevolutionary level, however, necessarily is based on extrapolation from evidence on the microevolutionary level. This article highlights primarily evidence for evolution on the macroevolutionary level applied to the theory of descent with modification. As broadly and commonly defined in the scientific community, the term evolution connotes heritable changes in populations of organisms over time, or changes in the frequencies of alleles over time. In this sense, the term does not specify any overall pattern of change through the ages, nor the process whereby change occurs, and it refers not to individual organisms but to populations of organisms through successive generations. However, the term evolution often is used with narrower meanings. It is not uncommon to see the term equated to the specific theory that all organisms have descended from common ancestors, which is also known as the theory of descent with modification. Less frequently, evolution sometimes is used to refer to one explanation for the process by which change occurs, the theory of modification through natural selection. In addition, the term evolution occasionally is used with reference to a comprehensive theory that includes both the non-causal pattern of descent with modification and the causal mechanism of natural selection. In reality, in Darwin's comprehensive theory of evolution, there actually can be elucidated at least five major, largely independent theories, including these two main theories (Mayr 1982). Other theories offered by Darwin deal with (3) evolution as such (the fact of evolution), (4) the gradualness of evolution, and (5) population speciation. The "theory of descent with modification" is the major theory covering the pattern of evolution—that is, it is descriptive and treats non-causal relations between ancestral and descendant species, orders, phyla, and so forth. The theory of descent with modification, also called the "theory of common descent," postulates that all organisms have descended from common ancestors by a continuous process of branching. In other words, in a restrictive sense, all life evolved from one kind of organism or from a few simple kinds, and each species arose in a single geographic location from another species that preceded it in time. Each taxonomic group—whether it be as limited in scope as a subspecies of fish or as extensive in scope as all St. Bernard dogs, all whales, all mammals, all vertebrates, or all human beings throughout history—shares a common ancestor or pair of common ancestors. In the broadest sense of the terminology, descent with modification simply means that more recent forms result from modification of earlier forms. One of the major contributions of Charles Darwin was to catalog evidence for the theory of descent with modification, particularly in his book Origin of Species. In the years since the book was published, biologists have added so substantially to the original body of evidence compiled by Darwin that most biologists consider the "pattern of evolution," that is, descent with modification—at least in the broader sense that more recent taxa came by modification from earlier forms, without specifying one or only a few original forms—to be well documented. In support of this view, the common evidences put forward are the fossil record, the distribution patterns of existing species, genetic correlations, and comparison of homologous structures. While the theory of descent with modification in the broad sense is supported, the conventional paradigm that the history of life maps as the "tree of life"—a tree beginning with one universal common ancestor as the trunk and then progressively branching, with modern species at the twig ends—is being re-drawn at both the base of the trunk and the branches. These revisions arise as scientists gain more understanding about the "hidden" world of microbes (unicellular organisms and viruses). The great diversity, abundance, and ubiquity of the single-celled organisms (bacteria, archaea, and some protists) has gained widespread recognition in recent years, and considerable progress has been made in incorporating that knowledge into the story of evolution. In contrast, the place of viruses in the story of evolution remains much more speculative. There are proposals that the tree of life instead of being simple at its base, may be considerably more complex. Sequencing the genomes of specific organisms yields support for the view in which tracing the ancestry of life back through time leads to something more like a bush representing the ongoing exchange of genetic material between diverse single-celled organisms—some of them with a nucleus and some without it—sharing genetic material tracing back further perhaps to a momentary convergence in a first nucleated cell (a first eukaryote) comprising some of the key genetic code that has been preserved even to humans today. Current evidence suggests that the eukaryote structure itself was a fusion product of the two different kinds of non-nucleated organisms—archaea and bacteria—with the archaea forming the nucleus and the bacteria the surrounding cytoplasm. Before the formation of eukaryotes, the archaea and the bacteria shared genetic material within, as well as between, their two great domains through horizontal gene transfer. By this model, the momentary constricting of the trunk of the tree of life when the eukaryote was formed might be envisioned as a single trunk emerging from a great root structure that has been variously called a ring or a bush or a network representing one or probably two common gene pools (Rivera and Lake 2004, Bacterial/Prokaryotic Phylogeny). The bush or network aspect of the ancestral track is consistent with the concept of evolution by endosymbiosis as proposed by biologist Lynn Margulis. She writes that "all visible organisms, plants, animals, and fungi evolved by 'body fusion.' Fusion at the microscopic level led to the integration and formation of ever more complex individuals." In the Margulis model, prokaryotes are a vast reservoir of diverse functions and metabolisms, including those that through cellular fusions have produced not only the first eukaryote, but also the energy-generating mitochondria, the photosynthetic chloroplasts, flagella, and cilia. Beyond these most basic of cellular components, Margulis sees evidence of such "symbiogenesis" in the successive acquisition of greater functionality in more complex organisms. Examples range from the rugged lichen as a fusion of a fungus and a photosynthetic alga (or a blue-green bacterium) to the leguminous plants dependent on nitrogen-fixing bacteria in their roots, the "higher" termites carefully tending the fungi they eat, and cows with their separate "stomach" housing bacteria converting grass eaten by the cows to a form the cows can digest (Margulis and Sagan 2002). Viruses add a new dimension to the story of evolution. Generally identified as not living and dependent on cells for reproduction, viruses, it now seems, have from early on and continuing to today played an active role in the exchange of genetic material both between unicellular and multicellular organisms. Needing the cellular machinery to multiply, viruses are adept at inserting their short genome into the host organism's genome, whether the host is unicellular or multicellular. While some viruses commandeer the cell's genetic machinery solely for reproducing the virus then spread when the cell bursts, other viruses insert their genome into the host genome and then linger without significantly disrupting the cell until some later time when the cell or its descendants experiences stress. This slow-acting viral invasion, called lysogenic viral infection, is, for example, what transforms an otherwise innocuous bacteria into the one that causes cholera. Higher on the tree of life, some scientists speculate, both viruses and unicellular organisms can transfer genes between distantly related organisms on different branches. Such horizontal gene transfers connecting different branches have been called "vines" on the tree of life (Kunin, Goldovsky, Darzentas, and Ouzounis 2005). Other complicating factors are proposed based on the relatively sudden appearance of phyla during the Cambrian explosion and on evidence that certain types of animals may have originated more than once and in different places at different times (Whittington 1985; Gordon 1999; Woese 1998; Wells 2000). The second major evolutionary theory is the "theory of modification through natural selection," also known as the "theory of natural selection." It involves mechanisms and causal relationships; in other words, the "process" by which evolution took place to arrive at the pattern. Natural selection may be defined as the mechanism whereby biological individuals that are endowed with favorable or deleterious traits reproduce more or less than other individuals that do not possess such traits. According to this theory, natural selection is the directing or creative force of evolution. The theory of natural selection was the most revolutionary and controversial concept advanced by Darwin. It comprises three components: (a) purposelessness (no higher purpose, just the struggle of individuals to survive and reproduce); (b) philosophical materialism (matter is seen as the ground of all existence with mind being produced by or a function of the material brain); and (c) the view that evolution is not progressive from lower to higher, but just an adaptation to local environments; it could form a man with his superior brain or a parasite, but no one could say which is higher or lower (Luria, Gould, and Singer 1981). In reality, most evidence presented in support of evolution is actually evidence for the theory of descent with modification. Concrete evidence for the theory of modification by natural selection is limited to microevolution—that is, evolution within populations or species. For example, modification by natural selection is observed as various species of bacteria develop increased pesticide resistance. Artificial selection within populations or species also provides evidence, such as in the production of various breeds of animals by selective breeding, or varieties of plants by selective cultivation. Evidence that natural selection directs the major transitions between taxa and originates new designs (macroevolution), however, necessarily involves extrapolation from evidences on the microevolutionary level. That is, it is inferred that if moths can change their color in 50 years, then new designs or entire new genera can originate over millions of years. It is further inferred that if geneticists see population changes for fruit flies in laboratory bottles, then given eons of time, birds can evolve from reptiles, and fish with jaws from jawless ancestors. For the broad concept of evolution ("any heritable change in a population of organisms over time"), evidences of evolution are readily apparent on a microevolutionary level. These include observed changes in domestic crops (creating a variety of maize with greater resistance to disease), bacterial strains (development of strains with resistance to antibiotics), laboratory animals (structural changes in fruit flies), and flora and fauna in the wild (color change in particular populations of peppered moths and polyploidy in plants). It was Charles Darwin, however, in the Origin of Species, who first marshaled considerable evidences for the theory of descent with modification on the macroevolutionary level. He did this within such areas as paleontology, biogeography, morphology, and embryology. Many of these areas continue to provide the most convincing proofs of descent with modification even today (Mayr 1982; Mayr 2001). Supplementing these areas are molecular evidences. Gould provides a good characterization of the common way of thinking about the evidence of evolution. Yet, it may be of interest to note that he is not offering a scientific analysis or proof. Rather, he suggests that only one hypothesis could make sense of the evidence—inheritance from a common ancestor, a common ancestor that presumably also possessed the same structures and same bones. This places Gould and the biology he characterizes in the position of depending on there being no counterexamples and no viable alternative hypotheses. For a discussion of a counterexample, see Homology. Those who would question the persuasiveness or legitimacy of evidence offered in support of the theory of descent with modification at the macroevolutionary level tend to be those who are seeking to reconcile earth's life and geology with their own sense of religion or spirituality. Various views of religion or spirituality have led people to insert into the discussions on evolution such views as: a young earth required by a literal interpretation of a scripture; a cosmic consciousness infusing all of the natural world; a cosmic designer shaping the pattern and products of evolution; or even a cosmic parent creating a human child in the cosmic parent's image. Young-earth or "scientific" creationists maintain that modern organisms did not descend from common ancestors, and that modern organisms' only historical connectedness is in the mind of God. Scientific creationists promulgate the view that living organisms are immutable, and were all created by God in a short time period, on an earth whose age is generally measured in thousands of years. The substantial fossil record is dismissed in various ways, including as a trick of God or as an artifact from the Great Flood (with some organisms sinking faster than others and thus settling onto a lower fossil plane). Although some individual presentations by scientific creationists are quite sophisticated, the overall theory of scientific creationism runs counter to an enormous body of evidence and thus is strongly criticized by most of the scientific community. Specific critiques of the theory of descent with modification have been made for most of the evidences of evolution, including the fossil record, structural and embryological homologies, and patterns of geographical distribution of species. The critiques tend to rely on the view that conventional evidences of evolution if viewed closely do not really support the conclusion there has been a continuous line of descent with modification from one or a few ancestors to the full array of life on earth today. The key word in several critiques is "continuous:" although the evidence may be suggestive of continuity, it becomes proof of continuity only in conjunction with an additional naturalistic premise. The premise is that all of the many gaps in the evidence must have been spanned by the same material processes that have already been observed. Hence, throughout the evolutionary process, only materialistic processes have been involved in producing the continuity of lineages extending from one or a few primeval ancestors to the earth's present hugely diverse flora and fauna, including humans. While some people who believe in God and the essential spiritual nature of human beings are comfortable with a fully materialistic evolutionary process, others intuitively sense that there must have been a substantial spiritual dimension to the workings of the evolutionary process. Such latter people are likely the source of many of the concrete critiques of the commonly-presented evidences of evolution. Examples of these critiques are attached, one each, to the following detailed elaborations in the sections on "Limitations of fossil evidence," "Homologous structures," "Vestigial organs," and "Evidence from embryology." An insect trapped in amber. Fossil evidence of prehistoric organisms has been found all over the earth. Fossils are traces of once living organisms. Fossilization of an organism is an uncommon occurrence, usually requiring hard parts (like bone), and death where sediments or volcanic ash may be deposited. Fossil evidence of organisms without hard body parts, such as shell, bone, teeth, and wood stems, is rare, but exists in the form of ancient microfossils and the fossilization of ancient burrows and a few soft-bodied organisms. 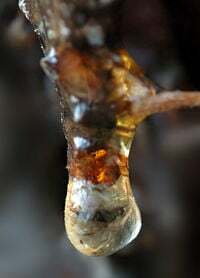 Some insects have been preserved in resin. The age of fossils can often be deduced from the geologic context in which they are found (the strata); and their age also can be determined with radiometric dating. The comparison of fossils of extinct organisms in older geological strata with fossils found in more recent strata or with living organisms is considered strong evidence of descent with modification. Fossils found in more recent strata are often very similar to, or indistinguishable from living species, whereas the older the fossils are, the greater the difference from living organisms or recent fossils. In addition, fossil evidence reveals that species of greater complexity have appeared on the earth over time, beginning in the Precambrian era some 600 millions of years ago with the first eukaryotes. The fossil records support the view that there is orderly progression in which each stage emerges from, or builds upon, preceding stages. When organisms die, they often decompose rapidly or are consumed by scavengers, leaving no permanent evidences of their existence. However, occasionally, some organisms are preserved. The remains or traces of organisms from a past geologic age embedded in rocks by natural processes are called fossils. They are extremely important for understanding the evolutionary history of life on Earth, as they provide direct evidence of evolution and detailed information on the ancestry of organisms. Paleontology is the study of past life based on fossil records and their relations to different geologic time periods. For fossilization to take place, the traces and remains of organisms must be quickly buried so that weathering and decomposition do not occur. Skeletal structures or other hard parts of the organisms are the most commonly occurring form of fossilized remains (Martin 1999). There are also some trace "fossils" showing molds, casts, or imprints of some previous organisms. As an animal dies, the organic materials gradually decay, such that the bones become porous. If the animal is subsequently buried in mud, mineral salts will infiltrate into the bones and gradually fill up the pores. The bones will harden into stones and be preserved as fossils. This process is known as petrification. If dead animals are covered by wind-blown sand, and if the sand is subsequently turned into mud by heavy rain or floods, the same process of mineral infiltration may occur. Apart from petrification, the dead bodies of organisms may be well preserved in ice, in hardened resin of coniferous trees (amber), in tar, or in anaerobic, acidic peat. Examples of trace fossils, an impression of a form, include leaves and footprints, the fossils of which are made in layers that then harden. 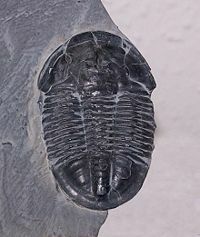 Fossil trilobite. Trilobites were hard-shelled arthropods, related to living horseshoe crabs and spiders, that first appeared in significant numbers around 540 mya, dying out 250 mya. It is possible to observe sequences of changes over time by arranging fossil records in a chronological sequence. Such a sequence can be determined because fossils are mainly found in sedimentary rock. Sedimentary rock is formed by layers of silt or mud on top of each other; thus, the resulting rock contains a series of horizontal layers, or strata. Each layer contains fossils that are typical for a specific time period during which they were made. The lowest strata contain the oldest rock and the earliest fossils, while the highest strata contain the youngest rock and more recent fossils. A succession of animals and plants can also be seen from fossil records. Fossil evidence supports the theory that organisms tend to progressively increase in complexity. By studying the number and complexity of different fossils at different stratigraphic levels, it has been shown that older fossil-bearing rocks contain fewer types of fossilized organisms, and they all have a simpler structure, whereas younger rocks contain a greater variety of fossils, often with increasingly complex structures. In the past, geologists could only roughly estimate the ages of various strata and the fossils found. They did so, for instance, by estimating the time for the formation of sedimentary rock layer by layer. Today, by measuring the proportions of radioactive and stable elements in a given rock, the ages of fossils can be more precisely dated by scientists. This technique is known as radiometric dating. Throughout the fossil record, many species that appear at an early stratigraphic level disappear at a later level. This is interpreted in evolutionary terms as indicating the times at which species originated and became extinct. Geographical regions and climatic conditions have varied throughout the Earth's history. Since organisms are adapted to particular environments, the constantly changing conditions favored species that adapted to new environments. According to fossil records, some modern species of plants and animals are found to be almost identical to the species that lived in ancient geological ages. They are existing species of ancient lineages that have remained morphologically (and probably also physiologically) somewhat unchanged for a very long time. Consequently, they are called "living fossils" by laypeople. Examples of "living fossils" include the tuatara, the nautilus, the horseshoe crab, the coelacanth, the ginkgo, the Wollemi pine, and the metasequoia. Despite the relative rarity of suitable conditions for fossilization, approximately 250,000 fossil species are known (Gore 2006). The number of individual fossils this represents varies greatly from species to species, but many millions of fossils have been recovered: For instance, more than three million fossils from the last Ice Age have been recovered from the La Brea Tar Pits (NHMLA 2007) in Los Angeles. Many more fossils are still in the ground, in various geological formations known to contain a high fossil density, allowing estimates of the total fossil content of the formation to be made. An example of this occurs in South Africa's Beaufort Formation (part of the Karoo Supergroup, which covers most of South Africa), which is rich in vertebrate fossils, including therapsids (reptile/mammal transitional forms) (Kazlev 2002). 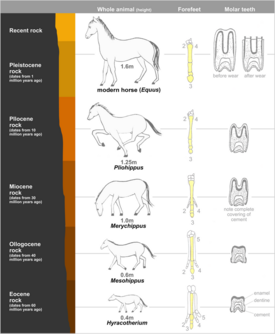 Evolution of the horse showing reconstruction of the fossil species obtained from successive rock strata. The foot diagrams are all front views of the left forefoot. The third metacarpal is shaded throughout. The teeth are shown in longitudinal section. Due to a substantial fossil record found in North American sedimentary deposits from the early Eocene to the present, the horse is considered to provide one of the best examples of evolutionary history (phylogeny). This evolutionary sequence starts with a small animal called the Hyracotherium that lived in North America about 54 million years ago, then spread across to Europe and Asia. Fossil remains of Hyracotherium show it to have differed from the modern horse in three important respects: It was a small animal (the size of a fox), lightly built and adapted for running; the limbs were short and slender, and the feet elongated so that the digits were almost vertical, with four digits in the forelimbs and three digits in the hindlimbs; and the incisors were small, the molars having low crowns with rounded cusps covered in enamel. Increases in tooth length, crown height of molars. A dominant genus from each geological period has been selected to show the progressive development of the horse. However, it is important to note that there is no evidence that the forms illustrated are direct descendants of each other, even though they are closely related. The fossil record is an important but intrinsically limited source of evidence of the evolutionary history of organisms. The vast expanse of geological time and the rarity of fossilization prescribes that the fossil record can at best offer clues to the broad patterns of evolution. Even the detailed history of transitions from an ancestral horse (Eohippus) to the modern horse (Equus), which has been characterized as being "articulately represented," remains sketchy despite the identification of "at least 12 genera and several hundred species." Such extensive fossils offer no evidence of direct ancestor-descendant relations that would need to be proven to prove the notion of continuous descent from a common ancestor. The horse ancestor fossil record is considered to be the most detailed fossil record of all. For most modern species, however, there is a general lack of gradually sequenced intermediary forms. There are some fossil lineages that appear quite well-represented, such as from therapsid reptiles to the mammals, and between what are considered the land-living ancestors of the whales and their ocean-living descendants (Mayr 2001). Archaeopteryx has been viewed by many as representing an intermediate stage between reptiles and birds. Generally, however, paleontologists do not find a steady change from ancestral forms to descendant forms. Rather, they find discontinuities, or gaps in most every phyletic series (Mayr 2002). This has been explained both by the incompleteness of the fossil record and by proposals of speciation that involve short periods of time, rather than millions of years. Notably, there are also gaps between living organisms, with a lack of intermediaries between whales and terrestrial mammals, between reptiles and birds, and between flowering plants and their closest relatives (Mayr 2002). Archaeopteryx has recently come under criticism as a transitional fossil between reptiles and birds (Wells 2000). There is a gap of about 100 million years between the early Cambrian period and the later Ordovician period. The early Cambrian period was the period from which numerous invertebrate fossils are found. These include: sponges, cnidarians (jellyfish), echinoderms (eocrinoids), mollusks (snails), and arthropods (trilobites). In the later Ordovician period, the first animal that really possessed the typical features of vertebrates, the Australian fish, Arandaspis appeared. Thus few, if any, fossils of an intermediate type between invertebrates and vertebrates have been found, although likely candidates include the Burgess Shale animal, Pikaia gracilens, and its Maotianshan Shales relatives, Myllokunmingia, Yunnanozoon, Haikouella lanceolata, and Haikouichthys. Using present-day biodiversity as a guide suggests that the fossils unearthed represent only a small fraction of the large number of species of organisms that lived in the past. One argument against using the fossil record as a support for evolutionary theory is that while the fossil record provides "consistent evidence of systematic change through time" (NAS 1999), its intrinsic irregularity and inconsistency precludes accumulation of the record of any continuous lineage. In terms of directly successive generations, the fossil record presents us with great gaps. Claiming such a spotty record as evidence of a lineage that is continuous through slow and gradual change requires assumptions for which there is no scientific evidence. Among scientists, one of the strong critics of the prevailing view that the fossil record indicates continuous, gradual change between species is Lynn Margulis. She writes, in collaboration with Dorian Sagan, that the many scientific insights of the 20th century show "that the luxuriant living diversity surrounding us did not evolve gradually, as the students of the fossil record so vociferously tell us. Precious little evidence in the sedimentary rocks exists for small steps that connect one species gradually to its descendants. . . . The discontinuous record of past life shows clearly that the transition from one species to another occurs in discrete jumps" (Margulis and Sagan 2002). Margulis proposes to explain the discrete jumps in part by endosymbiosis through which one organism comes to incorporate into its genome all or part of the genome of its former symbiont. The study of comparative anatomy also yields evidence that has been used to support the theory of descent with modification. For one, there are structures in diverse species that have similar internal organization yet perform different functions. Vertebrate limbs are a common example of such homologous structures. Bat wings, for example, are very similar to human hands. Also similar are the forelimbs of the penguin, the porpoise, the rat, and the alligator. In addition, these features derive from the same structures in the embryo stage. As queried earlier, “why would a rat run, a bat fly, a porpoise swim and a man type” all with limbs using the same bone structure if not coming from a common ancestor (Gould 1983). Likewise, a structure may exist with little or no function in one organism, while a very similar structure in other species may have a clear and essential function. These structures are called vestigial organs or vestigial characters. The wings of flightless birds, such as the ostrich and emu, and the remnant eyes of moles, some blind salamanders, and blind cave fish are examples. Such structures would be the prediction of the theory of descent with modification, suggesting that organisms with a vestigial structure share a common ancestry with organisms that have the same feature in a fully functional form. For the point of view of classification, it can be observed that various species exhibit a sense of "relatedness," such as various catlike mammals, which can be put in the same family (Felidae), dog-like mammals can be put in the same family (Canidae), and bears are in the same family (Ursidae). These and other similar mammals can be combined into the same order (Carnivora). This sense of relatedness, from external features, fits the expectations of the theory of descent with modification. Comparative study of the anatomy of groups of plants reveals that certain structural features are basically similar. For example, the basic components of all flower blossoms are sepals, petals, stigma, style, and ovary; yet the size, color, number of parts, and specific structure are different for each individual species. In deciding how closely related two animals are, a comparative anatomist looks for structures that are fundamentally similar, even though they may serve different functions in the adult. In cases where the similar structures serve different functions in adults, it may be necessary to trace their origin and embryonic development. A similar developmental origin suggests they are the same structure, and thus likely to be derived from a common ancestor. In biology, homology is commonly defined as any similarity between structures that is attributed to their shared ancestry. Darwin meant something different when he used "homology" in his theory of evolution. He was using the term with its classical meaning as it was coined by Richard Owen in the 1840s. Historically, homology was defined as similarity in structure and position, such as the pattern of bones in a bat's wing and those in a porpoise's flipper (Wells 2000). Conversely, the term analogy signified functional similarity, such as the wings of a bird and those of a butterfly. Homology in the classical sense, as similarity in structure and position of anatomical features between different organisms, was an important evidence used by Darwin. He used similarity in structures between diverse organisms—such as the similar skeletal structures (utilizing same bones) of the forelimbs of humans, bats, porpoises, birds, and cats—as evidence of evolution by common descent (theory of descent with modification). However, it would be incorrect to state that homology, as presently defined, provides evidence of evolution because it would be circular reasoning, with homology defined as similarity due to shared ancestry. Mayr (1982) states, "After 1859 there has been only one definition of homologous that makes biological sense… Attributes of two organisms are homologous when they are derived from an equivalent characteristic of the common ancestor." One of Darwin's own examples of homology offers an example of the hazard of presuming common ancestry based on structural similarity. The bird's wing structure is no longer included routinely as an example of homology because the presumed common ancestor of birds with mammals is too distant. That presumed common ancestor was a fish whose pectoral fins are thought to have been the common precursor structure of both mammal forelimbs and bird wings. When a group of organisms share a homologous structure that among the members of the group is variously specialized to perform a variety of functions in order to adapt to different environmental conditions and modes of life, that phenomenon is known as adaptive radiation. The gradual spreading of organisms with adaptive radiation is known as divergent evolution. Examples of divergent evolution are seen in the mammalian pentadactyl limb, insect mouth parts, and other arthropod appendages. The mammalian pentadactyl limb appears in a remarkable range of variations—from the human with arms supporting four fingers and an opposable thumb and with legs terminating in the five-toed foot, to the horse with four legs terminating in elaborations of only the third digit (third "finger" or "toe"), and the bat with webbed skin stretched from the "arm" bones and the four "finger" bones while the separate "thumb" bone as well as a five "toe" bones in the small foot each feature a claw used for gripping. Insect mouth parts similarly vary widely in their shape and function—from the strong biting and chewing capabilities of the grasshopper to the sucking capabilities of the butterfly and the piercing and sucking capabilities of the mosquito. As members of the phylum Arthropoda, meaning "jointed foot," insects demonstrate in the variety of their appendages—not only of their mouth parts, but also their legs and antennae—a pattern of adaptive variation of the appendages that is seen widely throughout the phylum. Inverted retina of vertebrate (left) and non-inverted retina of octopus (right). An example of convergent evolution and a counterexample to the Darwinian concept of homology. The remarkable similarity in the organs suggests they are homologous, but they cannot be so because they have no common ancestor with an equivalent characteristic. eyes of the vertebrates and cephalopod mollusks (squid and octopus). 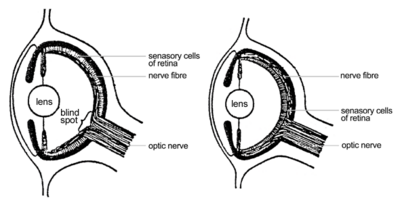 The above drawing of the two retinas illustrates difference between an inverted and non-inverted retina, the sensory cells lying beneath the nerve fibers. This results in the sensory cells being absent where the optic nerve is attached to the eye, thus creating a blind spot. The octopus eye has a non-inverted retina in which the sensory cells lie above the nerve fibers. There is therefore no blind spot in this kind of eye. Apart from this difference the two eyes are remarkably similar, an example of convergent evolution. A further aspect of comparative anatomy is the presence of vestigial organs. Organs that are smaller and simpler in structure than corresponding parts in the ancestral species, and that are usually degenerated or underdeveloped, are called vestigial organs. From the point of view of descent with modification, the existence of vestigial organs can be explained in terms of changes in a descendant species, perhaps connected to changes in the environment or modes of life of the species. Those organs are thought to have been functional in the ancestral species but to have since become unnecessary and non-functional. Examples are the vestigial hind limbs of whales, the haltere (vestigial hind wings) of flies and mosquitos, vestigial wings of flightless birds such as ostriches, and the vestigial leaves of some xerophytes (e.g. cactus) and parasitic plants (e.g. dodder). It must be noted however, that vestigial structures have lost the original function but may have another one. For example, the halteres in dipterists help balance the insect while in flight and the wings of ostriches are used in mating rituals. The human vermiform appendix, an appendage of the cecum (the ascending colon) has long been claimed by evolutionary biologists as an example of a vestigial organ. It has been compared with the rabbit's appendix, which is large and apparently functional as an aid in digesting cellulose. The modern discovery of useful functions for the human appendix is still somewhat controversial in the field of human physiology. Evidence has been uncovered for useful functions of the appendix in both fetal and adult humans. These include producing important compounds in fetuses (biogenic amines and peptide hormones), serving an immune function by working as a lymphatic organ in adults, and providing a safe haven for useful bacteria (Rowland 2007; Zahid 2004; AP 2007). The evidence of these functions calls into question the designation of the vermiform appendix as a vestigial organ. Other commonly listed examples of vestigial elements in humans include ear muscles, wisdom teeth, and the formation of goose bumps as a fear response. The field of embryology has long been claimed as a source of evidence supporting descent with modification. The assertion has been that the embryos of related animals are often quite similar to each other, often much more similar than the adult forms, and hence the embryos provide evidence of their descent from common ancestors. For example, it is held that the development of the human embryo correlates closely with comparable stages of other kinds of vertebrates (fish, salamander, tortoise, chicken, pig, cow, and rabbit). Furthermore, it is asserted that mammals such as cows and rabbits are more similar in embryological development than with alligators. The drawings of early vertebrate embryos by Ernst Haeckel have often been offered as proof of these presumed correlations even though the accuracy of those same drawings has been widely refuted (Gilbert 2006). It has further been asserted that features, such as the "gill pouches" in the mammalian embryo resembling those of fish, are most readily explained as being remnants from the ancestral fish, which were not eliminated because they are embryonic "organizers" for the next step of development. The geographic distribution of plants and animals offers another commonly cited evidence for evolution (common descent). The fauna on Australia, with its large marsupials, is very different from that of the other continents. The fauna on Africa and South America are very different, but the fauna of Europe and North America, which were connected more recently, are similar. There are few mammals on oceanic islands. These findings support the theory of descent with modification, which holds that the present distribution of flora and fauna would be related to their common origins and subsequent distribution. The longer the separation of continents, as with Australia's long isolation, the greater the expected divergence is. Writing in 1982, Mayr states that "the facts of biogeography ... were eventually used by Darwin as his most convincing evidence in favor of evolution." Biologists have discovered many puzzling facts about the presence of certain species on various continents and islands (biogeography). Africa has short-tailed (Old World) monkeys, elephants, lions, and giraffes. South America has long-tailed monkeys, cougars, jaguars, and llamas. The echidna and platypus, the only living representatives of primitive egg-laying mammals (monotremes), can be found only in Australia and are totally absent in the rest of the world. On the other hand, Australia has very few placental mammals except those that have been introduced by human beings. 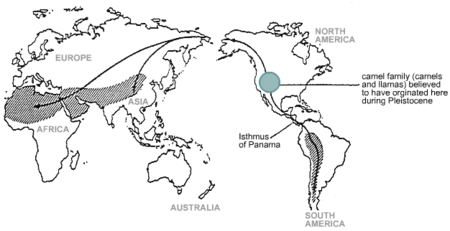 : The world map showing (A) land bridges between continents in past geologic time with black lines and arrows representing the spread of modern mammals from a probable origin in the northern hemisphere into the southern continents and (B) water barriers (straits) formed due to the submergence of land bridges. Once isolated by the water barriers at straits, the animals in each continent have shown adaptive radiation to evolve along their own lines. To South America via two land bridges: one connecting Asia with North America and one (the Isthmus of Panama) connecting North America with South America. A large number of families of South American marsupials became extinct as a result of competition with these Northern Hemisphere counterparts. To Africa via the land bridge connecting Europe and Africa at today's Gibralter. To Australia via the South East Asia peninsula and islands, which at at a time of low sea level formed a continuous land bridge extending to Australia. The shallowness of the Bering Strait today means that a lowering of the sea level in the past would have readily exposed a land bridge between the two northern continents permitting a relatively easy passage of animals between the two continents. Such a perspective offers a ready explanation of the present-day similarity of the faunas of Eurasia and North America. But once they got down into the southern continents, they presumably became isolated from each other by various types of barriers. The submerging of the Isthmus of Panama: Isolates the South American fauna. The Mediterranean Sea and the North African desert: Partially isolate the African fauna. Map of the world showing distribution of present members of camel. Solid black lines indicate possible migration routes that would have crossed land bridges at a time of low sea level. Camels and their relatives, the llamas, are found on two continents, with true camels in Asia and Africa, and llamas in South America (Mayr 2001). There are no camels in North America. Based on descent with modification, it would be expected that camels once existed in North America but became extinct. Indeed, there was the discovery of a large fossil fauna of Tertiary camels in North America (Mayr 2001). One proposal for the fossil record for the camel is that camels started in North America, from which they migrated across the Bering Strait into Asia and hence to Africa, and through the Isthmus of Panama into South America. Once isolated, they evolved along their own lines, producing the modern camel in Asia and Africa, the llama in South America, and becoming extinct in North America. The same kinds of fossils are found from areas known to have been adjacent to one another in the past, but which, through the process of continental drift, are now in widely divergent geographic locations. For example, fossils of the same types of ancient amphibians, arthropods, and ferns are found in South America, Africa, India, Australia, and Antarctica, which can be dated to the Paleozoic Era, at which time these regions were united as a single landmass called Gondwana. Sometimes the descendants of these organisms can be identified and show unmistakable similarity to each other, even though they now inhabit very different regions and climates. Most small isolated islands only have native species that could have arrived by air or water: Birds, insects, and turtles. The few large mammals present today were brought by human settlers in boats. Plant life on remote and recent volcanic islands like Hawaii could have arrived as airborne spores or as seeds in the droppings of birds. After the explosion of Krakatoa a century ago and the emergence of a steaming, lifeless remnant island called Anak Krakatoa (child of Krakatoa), plants arrived within months and within a year there were moths and spiders that had arrived by air. Scarcely more than a century later the island has nearly completely recovered—to the extent that it is now difficult to distinguish the island ecologically from others nearby that have been there for millions of years. Evidence for common descent may be found in traits shared between all living organisms. In Darwin's day, the evidence of shared traits was based solely on visible observation of morphologic similarities, such as the fact that all birds—even those which do not fly—have wings. Today, the theory of common descent is supported by genetic similarities. For example, every living cell makes use of nucleic acids as its genetic material, and uses the same twenty amino acids as the building blocks for proteins. All organisms use the same genetic code (with some extremely rare and minor deviations) to specify the nucleic acid sequences that form proteins. The universality of these traits strongly suggests common ancestry, because the selection of these traits seems somewhat arbitrary. Similarly, the metabolism of very different organisms is based on the same biochemistry. For example, the protein cytochrome c, which is needed for aerobic respiration, is universally shared in aerobic organisms, suggesting a common ancestor that used this protein. There are also variations in the amino acid sequence of cytochrome c, with the more similar molecules found in organisms that appear more related (monkeys and cattle) than between those that seem less related (monkeys and fish). The cytochrome c of chimpanzees is the same as that of humans, but very different from that of bread mold. Similar results have been found with blood proteins. The closer that organisms appear to be related, the more similar are their respective genetic sequences. That is, comparison of the genetic sequence of organisms reveals that phylogenetically close organisms have a higher degree of sequence similarity than organisms that are phylogenetically distant. Comparison of the DNA sequences allows organisms to be grouped by sequence similarity, and the resulting phylogenetic trees are typically congruent with traditional taxonomy, and are often used to strengthen or correct taxonomic classifications. Sequence comparison is considered a measure robust enough to be used to correct erroneous assumptions in the phylogenetic tree in instances where other evidence is scarce. For example, neutral human DNA sequences are approximately 1.2 percent divergent (based on substitutions) from those of their nearest genetic relative, the chimpanzee, 1.6 percent from gorillas, and 6.6 percent from baboons (Chen and Li 2001; Cooper et al. 2003). Further evidence for common descent comes from genetic detritus such as pseudogenes, regions of DNA that are orthologous to a gene in a related organism, but are no longer active and appear to be undergoing a steady process of degeneration. Such genes are called "fossil" genes. Since metabolic processes do not leave fossils, research into the evolution of the basic cellular processes is done largely by comparing the biochemistry and genetics of existing organisms. The proteomic evidence also supports the universal ancestry of life. Vital proteins, such as the ribosome, DNA polymerase, and RNA polymerase, are found in everything from the most primitive bacteria to the most complex mammals. The core part of the protein is conserved across all lineages of life, serving similar functions. Higher organisms have evolved additional protein subunits, largely affecting the regulation and protein-protein interaction of the core. Other overarching similarities between all lineages of extant organisms, such as DNA, RNA, amino acids, and the lipid bilayer, give support to the theory of common descent. The chirality of DNA, RNA, and amino acids is conserved across all known life. As there is no functional advantage to right- or left-handed molecular chirality, the simplest hypothesis is that the choice was made randomly by early organisms and passed on to all extant life through common descent. On the microevolutionary level (change within species), there are evidences that natural selection does produce evolutionary change. For example, changes in gene frequencies can be observed in populations of fruit flies exposed to selective pressures in the laboratory environment. Likewise, systematic changes in various phenotypes within a species, such as color changes in moths, has been observed in field studies. However, evidence that natural selection is the directive force of change in terms of the origination of new designs (such as the development of feathers) or major transitions between higher taxa (such as the evolution of land-dwelling vertebrates from fish) is not observable. The conventional view of evolution is that macroevolution is simply microevolution continued on a larger scale, over large expanses of time. That is, if one observes a change in the frequencies of spots in guppies within 15 generations, as a result of selective pressures applied by the experimenter in the laboratory, then over millions of years one can get amphibians and reptiles evolving from fish due to natural selection. If a change in beak size of finches is seen in the wild in 30 years due to natural selection, then natural selection can result in new phyla if given eons of time. Indeed, the only concrete evidence for the theory of modification by natural selection—that natural selection is the causal agent of both microevolutionary and macroevolutionary change—comes from microevolutionary evidences, which are then extrapolated to macroevolution. However, the validity of making this extrapolation has been challenged from the time of Darwin, and remains controversial today. Challenges to the theory of natural selection come from both the scientific and religious communities. In some cases, key arguments against natural selection being the main or sole agent of evolutionary change come from evolutionary scientists. Some see microevolution as decoupled from macroevolution in terms of mechanisms, with natural selection being incapable of being the creative force of macroevolutionary change (Luria, Gould, and Singer 1981). Historically, the strongest opposition to Darwinism, in the sense of being a synonym for the theory of natural selection, has come from those advocating religious viewpoints. In essence, the chance component involved in the creation of new designs, which is inherent in the theory of natural selection, runs counter to the concept of a Supreme Being who has designed and created humans and all phyla. Chance (stochastic processes) is centrally involved in the theory of natural selection. As noted by Mayr (2001), chance plays an important role in two steps. First, the production of genetic variation "is almost exclusively a chance phenomena." Secondly, chance plays an important role even in "the process of the elimination of less fit individuals," and particularly during periods of mass extinction. This element of chance counters the view that the development of new evolutionary designs, including humans, was a progressive, purposeful creation by a Creator God. Rather than the end result, according to the theory of natural selection, human beings were an accident, the end of a long, chance-filled process involving adaptations to local environments. There is no higher purpose, no progressive development, just materialistic forces at work. Such views are squarely at odds with many religious interpretations. A key point of contention between the worldviews is, therefore, the issue of variability—its origin and selection. For a Darwinist, random genetic mutation provides a mechanism of introducing novel variability, and natural selection acts on the variability. For those believing in a creator God, the introduced variability is not random, but directed by the Creator, although natural selection may act on the variability, more in the manner of removing unfit organisms than in any creative role. Some role may also be accorded differential selection, such as mass extinctions. Neither of these worldviews—random variation and the purposeless, non-progressive role of natural selection, or purposeful, progressive variation—are conclusively proved or unproved by scientific methodology, and both are theoretically possible. At question has always been the sufficiency of extrapolation to the macroevolutionary level. As Mayr (2001) notes, "from Darwin's day to the present, there has been a heated controversy over whether macroevolution is nothing but an unbroken continuation of microevolution, as Darwin and his followers have claimed, or rather is disconnected from microevolution." The following are evidences of natural selection, albeit at the microevolutionary level. In the laboratory, biologists have demonstrated natural selection on the microevolutionary level involving organisms with short lifecycles, such as fruit flies, guppies, and bacteria, which allow testing over many generations. Endler (1980) set up populations of guppies (Poecilia reticulata) and their predators in artificial ponds in the laboratory, with the ponds varying in terms of the coarseness of the bottom gravel. Guppies have diverse markings (spots) that are heritable variations and differ from individual to individual. Within 15 generations in this experimental setup, the guppy populations in the ponds had changed according to whether they were exposed to coarse gravel or fine gravel. The end result was that there was a greater proportion of organisms with those markings that allowed the guppies to better blend in with their particular environment, and presumably better avoid being seen and eaten by predators. When predators were removed from the experimental setup, the populations changed such that the spots on the guppies stood out more in their environment, likely to attract mates, in a case of sexual selection. Likewise, bacteria grown in a Petri dish can be given an antibiotic, such as penicillin, that is just strong enough to destroy most, but not all, of the population. If repeated applications are used after each population returns to normal size, eventually a strain of bacteria with antibiotic resistance may be developed. This more recent population has a different allele frequency than the original population, as a result of selection for those bacteria that have a genetic makeup consistent with antibiotic resistance. In the field, natural selection on the microevolutionary level has also been demonstrated. Both antibiotic-resistant bacteria and populations of pesticide-resistant insects have been frequently observed in the field. Since the introduction of house sparrows in North America in 1852, they have developed different characteristics in different locations, with larger-bodied populations in the north. This is assumed to be a heritable trait, with selection based on colder weather in the north. In England, a systematic color change in the peppered moth, Biston betularia, has been observed over a 50-year period, although there is some controversy whether this can be attributed to natural selection (Wells 2000). In this case, two forms of peppered moths exist, melanic and non-melanic forms. Field studies during this five decade period suggest that melanic forms increased in proportion in polluted areas because of the phenomenon of industrial melanism. This shift toward darker melanic forms is attributed to an heightened predation by birds of the light-colored moths, because the lighter forms could more easily be seen on the tree trunks that have been increasingly darkened from pollution. However, Wells (2000) pointed out that there are flaws in the studies, including the fact that peppered moths do not normally alight on tree trunks, and there are even inverse correlations with pollution in many situations. A well-known field example of microevolution attributed to natural selection is the study done by Peter Grant and B. Rosemary Grant (2002) on Galapagos finches. They studied two populations of finches on a Galapagos island and observed changes in body size and beak traits. For example, after a drought, they recorded that survivors had slightly larger beaks and body size. This is an example of an allele change in populations—microevolution. It is also an apparent example of natural selection, with natural selection defined according to Mayr (2001) as, "the process by which in every generation individuals of lower fitness are removed from the population." However, the Grants also found an oscillating effect: When the rains returned, the body and beak sizes of the finches moved in the opposite direction. Schematic representation of how antibiotic resistance is enhanced by natural selection. The top section represents a population of bacteria before exposure to an antibiotic. The middle section shows the population directly after exposure, the phase in which selection took place. The last section shows the distribution of resistance in a new generation of bacteria. The legend indicates the resistance levels of individuals. A commonly cited example of natural selection in action is the development of antibiotic resistance in microorganisms. Antibiotics have been used to fight bacterial diseases since the discovery of penicillin in 1928 by Alexander Fleming. However, the widespread use of antibiotics has led to increased microbial resistance against antibiotics, to the point that the methicillin-resistant Staphylococcus aureus (MRSA) has been described as a "superbug" because of the threat it poses to health and its relative invulnerability to existing drugs. Recently, several new strains of MRSA have emerged that are resistant to vancomycin and teicoplanin. The appearance of vancomycin resistant Staphlococcus aureus, and the danger it poses to hospital patients is considered a direct result of evolution through natural selection. This exemplifies a situation where medical researchers continue to develop new antibiotics that can kill the bacteria, and this leads to resistance to the new antibiotics. A similar situation occurs with pesticide resistance in plants and insects. The appearance of DDT resistance in various forms of Anopheles mosquitoes, and the appearance of myxomatosis resistance in breeding rabbit populations in Australia are all considered similar evidence of the existence of evolution in situations of evolutionary selection pressure in species in which generations occur rapidly. Another example involves the hawthorn fly, Rhagoletis pomonella, a native of North America also known as the apple maggot fly, which appears to be undergoing sympatric speciation. Different populations of hawthorn fly feed on different fruits. A new population spontaneously emerged in North America in the nineteenth century sometime after apples, a non-native species, were introduced. The apple-feeding population normally feeds only on apples and not on the historically preferred fruit of hawthorns. Likewise the current hawthorn feeding population does not normally feed on apples. A current area of scientific research is the investigation of whether or not the apple-feeding race may further evolve into a new species. Some evidence, such as the facts that between the two variants allele frequencies at six out of thirteen allozyme loci are different, that hawthorn flies mature later in the season and take longer to mature than apple flies, and that there is little evidence of interbreeding (researchers have documented a 4 to 6 percent hybridization rate) suggests this possibility. (See Berlocher and Bush 1982; Berlocher and Feder 2002; Bush 1969; McPheron, Smith, and Berlocher 1988; Prokopy, Diehl, and Cooley 1988; Smith 1988). Analogously to natural selection, for thousands of years, humans have artificially manipulated changes within species through artificial selection. By selecting for preferred characteristics in cattle, horses, grains, and so forth, various breeds of animals and varieties of plants have been produced that are different often in significant respects from their ancestors. Computer science allows the iteration of self changing complex systems to be studied, allowing a mathematical approach to understanding the nature of the processes behind evolution. Based on human concepts, such computer programs have provided theoretical evidence for the possibility of natural selection directing macroevolutionary changes and insights into possible hidden causes of known evolutionary events (Adami et al. 2000; Earl and Deem 2004; Stemmer 1994). Adami, C., C. Ofria, and T. C. Collier. 2000. Evolution of biological complexity. PNAS 97(9): 4463-4468. Retrieved July 24, 2007. Bacterial/ Prokaryotic Phylogeny. The Origin of the Eukaryotic Cell. Bacterial/ Prokaryotic Phylogeny. Retrieved February 9, 2009. Berlocher, S. H., and G. L. Bush. 1982. An electrophoretic analysis of Rhagoletis (Diptera: Tephritidae) phylogeny. Systematic Zoology 31: 136–155. Berlocher, S. H., and J. L. Feder. 2002. Sympatric speciation in phytophagous insects: moving beyond controversy? Annual Review of Entomology 47: 773–815. Bush, G. L. 1969. Sympatric host race formation and speciation in frugivorous flies of the genus Rhagoletis (Diptera: Tephritidae). Evolution 23: 237–251. Chen, F. C., and W. H. Li. 2001. Genomic divergences between humans and other hominoids and the effective population size of the common ancestor of humans and chimpanzees. Am J Hum Genet 68(2): 444-456. Retrieved July 24, 2007.
Cooper, G. M., M. Brudno, NISC Comparative Sequencing Program, E. D. Green, S. Batzoglou, and A. Sidow. 2003.Quantitative estimates of sequence divergence for comparative analyses of mammalian genomes. Genome Research Vol 13(5): 813-820. Earl, D. J., and M. W. Deem. 2004. Evolvability is a selectable trait. PNAS 101(32): 11531-11536. Retrieved July 24, 2007. Gilbert, S. F. 2006. Ernst Haeckel and the Biogenetic Law Developmental Biology, 8th ed. Sinauer Associates. Retrieved January 30, 2009. Gore, P. J. W. 2006. Fossil Preservation Laboratory. Department of Zoology, Georgia Permeter College. Retrieved July 24, 2007. Kazlev, M. A. 2002. Tetrapod fossil sites: The Karoo Basin. Palaeos. Retrieved July 24, 2007. Kunin, V., Goldavsky, L., Darzentas, N., and Ouzounis, C. 2005. The net of life: Reconstructing the microbial phylogenetic network. Genome Research. 1 July 2005. Retrieved February 12, 2009. McPheron, B. A., D. C. Smith, and S. H. Berlocher. 1988. Genetic differentiation between host races of Rhagoletis pomonella. Nature 336: 64–66. National Academy of Sciences (NAS). 1999. [Science and Creationism: A View from the National Academy of Sciences, 2nd ed.. National Academies Press. Retrieved January 23, 2009. Natural History Museum of Los Angeles County (NHMLA). 2007. Return to the Ice Age: The La Brea Exploration Guide. Natural History Museum of LA County. Retrieved July 24, 2007. Prokopy, R. J., S. R. Diehl, and S. S. Cooley. 1988. Behavioral evidence for host races in Rhagoletis pomonella flies. Oecologia 76: 138–147. Rivera, M. C. and Lake, J. A. 2004. The ring of life provides evidence for a genome fusion origin of eukaryotes. Nature 431: 152-155. Retrieved February 10, 2009. Stemmer, W. P. 1994. DNA shuffling by random fragmentation and reassembly: In vitro recombination for molecular evolution. Proc Natl Acad Sci U S A 91(22): 10747–10751. 29+ Evidences for Macroevolution: The Scientific Case for Common Descent. A critique of the aforementioned 29+ Evidences for Macroevolution. History of "Evidence of evolution"
This page was last modified on 9 August 2017, at 18:08.